nPerspect is media for relationships. Every month each party expresses the level of quality they're experiencing within their relationship. Applying a fast, easy, online, automated process, both parties are continuously informed of the health or jeopardy within their relationship. How? Each party defines their own critical parameters of relationship quality, then at the beginning of each month, SnapTool™ captures and illuminates these important realities that were previously hidden until nPerspect. The graphical metric, the QR Snapshot™ becomes the "vital signs" of your important relationships. By being armed with empowering instrumentation, each party gains positive validation on a regular basis — or becomes alerted to lurking dangers — before it's too late! What's more essential to an enduring relationship than crystal clear agreement of each other's needs and accountabilities? What's better than itemized documentation for purging assumptions and misunderstandings? No, not the typical legal fine print anticipating failure; but rather, clear instructive content for each other that better ensures shared success. nPerspect addresses this universal need with ShakeTool™. 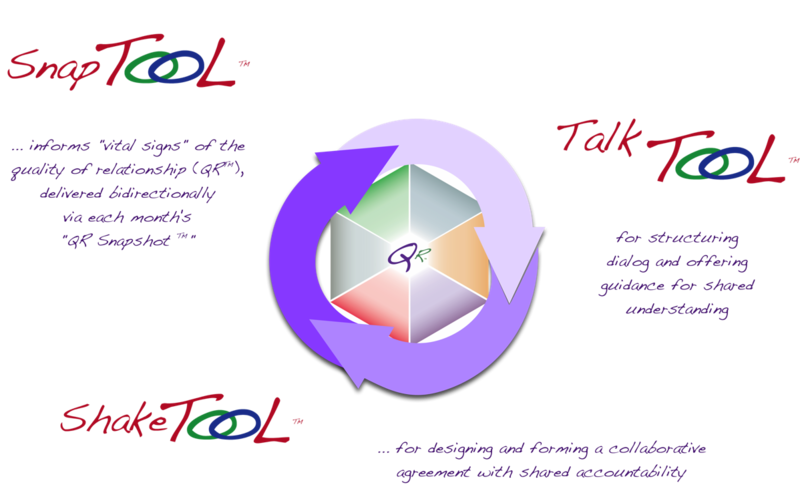 This is an online process of balanced collaboration leading step-by-step to mutually satisfying and guiding agreements. Nothing is left to doubt, hope, luck, or fate. Every requirement, preference or aversion can be proposed, accepted, rejected or discussed. This online process culminates in the agreement for a Durable Relationship.™ It can be referenced 24/7/365, and modified anytime. Dialog is a vital aspect of any crucial relationship. nPerspect offers Durable Relationship™ organizing principles, plus structured quality metrics of the current QR Snapshot™ and comprehensive support. Everything is impartial, neutral and without any bias to either party. Get the Durable Relationship white paper here. Each party is guided with TalkTool™ before, and within, dialog to discover and diagnose issues or opportunities within their relationship. This tool encourages more effective preparation, probing, listening and proposal. TalkTool also serves to desensitize tough topics, reduce emotions and inhibit conflict — while sensitizing each party to the important matters and parameters that demand their attention. 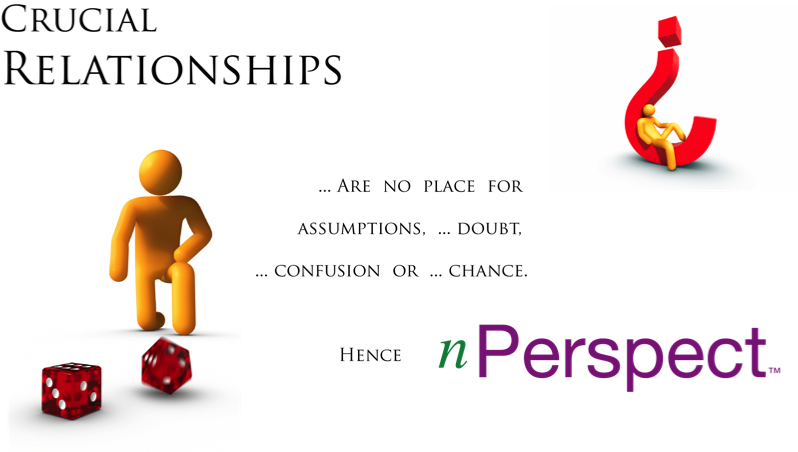 In addition to improving quality across the many contexts of relationships between two persons, nPerspect can be utilized to significantly improve relations between groups or communities. This powerful solution suite can advance relationship quality within, or between, teams and departments within an organization; between an enterprise and its customers or its vendors; within social or marketplace ecosystems of all types — and who knows, perhaps even between political factions and nations! 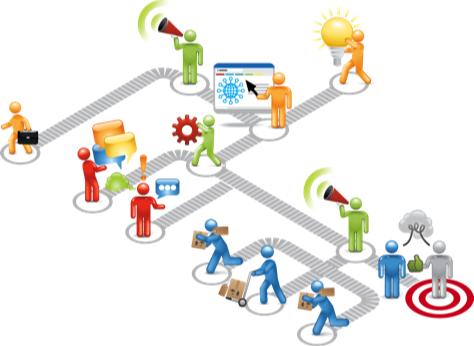 Know and improve the quality of every relationship between worker and supervisor throughout a workplace ecosystem! A specially-designed configuration of nPerspect stands ready to generate better worker relationships, performance and accountability from the executive suites to the front lines of the marketplace. This powerful configuration is known as rpPaQ™. This innovative enterprise solution makes problematic conventional "performance reviews" and "satisfaction surveys" obsolete. 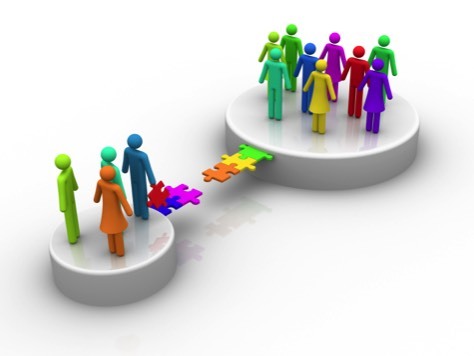 rpPaQ's compelling organizing principles are based upon Relationship Performance™ This advancement of work theory reliably explains universal, bilateral realities of today's workplace relations and workforce strategies, from both the workers' and the organizations' points of view. Furthermore, relations-based work role diagnostics and design is made possible by RoleDesigner™, the first enterprise power tool for defining, stewarding and optimizing talent relations. with all rights reserved, and inclusive of applicable domestic and international copyrights and patents.